Detail : Paul's first solo single. Dave Spinozza and Hugh McCracken (guitars) and Denny Seiwell (drums), with Paul producing. (credited to "Mr. and Mrs. McCartney" on the label). Sir Lew Grade, who owned Paul's publishing, maintained that Linda was incapable of writing any song. The brief lawsuit had one positive outcome, it made Linda write "Seaside Woman". The single did very well reaching number two, but was kept off the top slot by, Mungo Jerry and "Baby Jump". 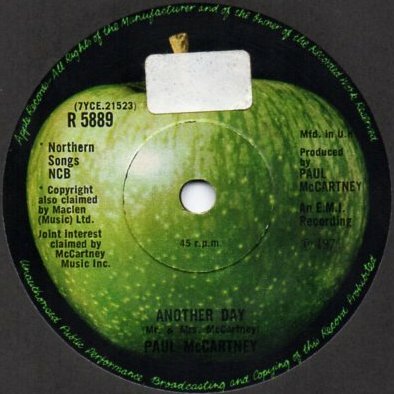 On the standard Apple label, the single did NOT appear in a picture cover in the U.K. but just a plain black sleeve. 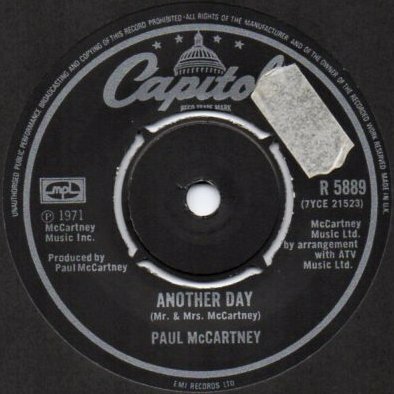 There are initial release label variants, below the Northern Songs publishing credit, some copies have "Joint interest claimed by McCartney Music Inc". Others have an additional claim of "Copyright also claimed by Maclen (Music) Ltd." as seen above. but retained the Parlophone catalogue number, as shown above. The publishing credit appears to be much clearer too with no counter claims. The single sold a reported one million copies worldwide.